Trello is an excellent lightweight project management tool. It is easy on the eye and relatively straightforward to use, but let down by its lack of reporting and time-tracking tools. 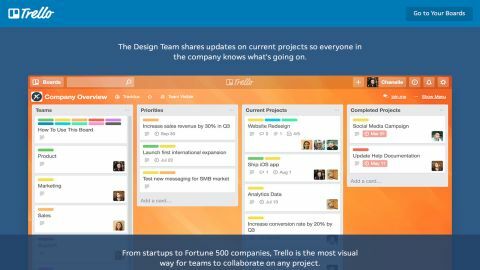 Trello is a web-based project management solution, originally created by Fog Creek Software in 2011. It formed its own company in 2014 and has since been sold to Atlassian. Trello provides tools to define projects and their requirements, and includes a digital dashboard where you can create, organize and prioritize actions. The card system employed allows team members to interact and collaborate with each other on projects – users can add comments, links, files and photos to project cards. Trello integrates with a variety of applications and has its own mobile apps for iOS and Android. There is even a Trello app for Slack. Trello has three price tiers. The ‘Free’ tier offers unlimited boards, lists, cards, members, checklists and attachments. It also includes one power-up per board and you can attach files of up to 10MB or link any file from your Google Drive, Dropbox, Box or OneDrive accounts. The ‘Business Class’ package costs $9.99 (£7.80) per month when paid annually. This has all the ‘Free’ tier has to offer plus unlimited power-ups, integrations with Bitbucket, Evernote, Google Hangouts (amongst others), and you can attach files of up to 250MB. You can also organize all your boards with Collections, control who can see your boards, benefit from restricted membership invitations, custom backgrounds and priority email support. The ‘Enterprise’ plan costs up to $20.83 (£16.28) when paid annually. It comes with all the functionality of the ‘Business Class’ package plus two-factor authentication, personalized onboarding assistance, comprehensive legal contract review, enhanced SLA, file encryption at rest, intrusion detection and custom security review. Trello makes setup a very uncomplicated process which only takes a matter of minutes. You don’t need to enter a mountain of information in order to get started – you only need your name, email, password and you are ready to go. Users are immediately brought to their own dashboard. You can work on a previously untitled board or create a new one. You can change your name, initials, bio, avatar, password, email and language settings via your initials at the top-right of the screen. You are also able to change your avatar from initials to a photo of your choice. You can edit your notification settings from here, too, and users who are color blind can enable ‘Color Blind Friendly Mode’. Users are able to access information regarding keyboard shortcuts from the top right-hand side of the screen. Trello is available through the website or via a dedicated app for macOS and Windows users. Trello’s interface is clean and fresh looking. It is also very easy to navigate. The main screen displays your recently viewed boards and your personal boards. You can create a team and access other boards from the left-hand side of the screen. Users can manage notifications via the ‘Notification’ icon at the top right-hand side of the screen. Information about how to use Trello is available here also – you see a different handy tip each time you click on the ‘i’ icon. Support is accessed through your avatar icon. Assistance is available via the help site through online articles, the Trello Community, or you can send Trello a message. Paid subscribers are guaranteed an answer within 24 hours. Your team can create boards from the main dashboard or from the Boards tab, and each board can be named to suit the project. You can then add in ‘To Do’, ‘Doing’ and ‘Done’ tasks. These can be scheduled for certain dates and times. Trello defaults to a blue background. This can be customized from the right-hand side of the Boards screen. You can change to other colors or use a picture if you prefer. Cards can be filtered with colored labels and set for certain times e.g. ‘Due in the next week’. You can also set the privacy filters to public, private or team only. Trello Power-Ups add extra functionality to your boards. You can add buttons to boards, show previews of attachments on Trello cards, and more. Certain power-ups add a calendar view, voting, Google Drive and Notejoy. These customize your project and allow you to do more within Trello. The ‘Butler’ power-up, for example, allows for automation of your boards with rules, scheduled commands and custom buttons. You can create rules which trigger automatically when you perform certain actions, customize boards with your favorite actions and filter lists by due date, title, time in list, votes, and so forth. Adding a power-up to a specific board is very simple. After choosing your power-up, you just click on the Add button, select the board you want, and it’s added immediately. The power-up will then be visible on the top-right of the chosen board’s dashboard. All power-ups are free but most come with an upgrade cost which includes more features. Trello has mobile apps for both Android and iOS. There's also a Trello app for Slack. The apps have basically the same functionality as the web interface. This makes it easier for you to switch from the desktop to the mobile app. Also worth noting is the fact that Trello integrates with a variety of third-party applications. These include Slack, Google Drive, Jira, HourStack, Gmail, Placker, Box and Gantify amongst others. Finally, we should mention Trello Gold, which is geared more towards individual users and those subscribing to the ‘Free’ tier. It is a handy little feature where you can add extras for an additional $5 (£3.90) per month. This includes up to three power-ups on any board per month, 250MB file attachments and extra board customization such as stickers, emojis and backgrounds. Trello is an easy to use, flexible and fun project management tool. It includes a handy drag and drop feature when working on your boards. Setup is straightforward and only takes a matter of minutes. Trello is a lightweight management solution which is most suited to those who do not need the general tools which accompany most project management apps. For those users who need built-in reporting and time tracking, Zoho Projects is a better choice. However, Trello is easy on the eye and simple to navigate. You can manage your team and their tasks through each board you create. Everything is displayed neatly and coherently, and you will have no problem following your project’s progress through this platform.